What better start than this. 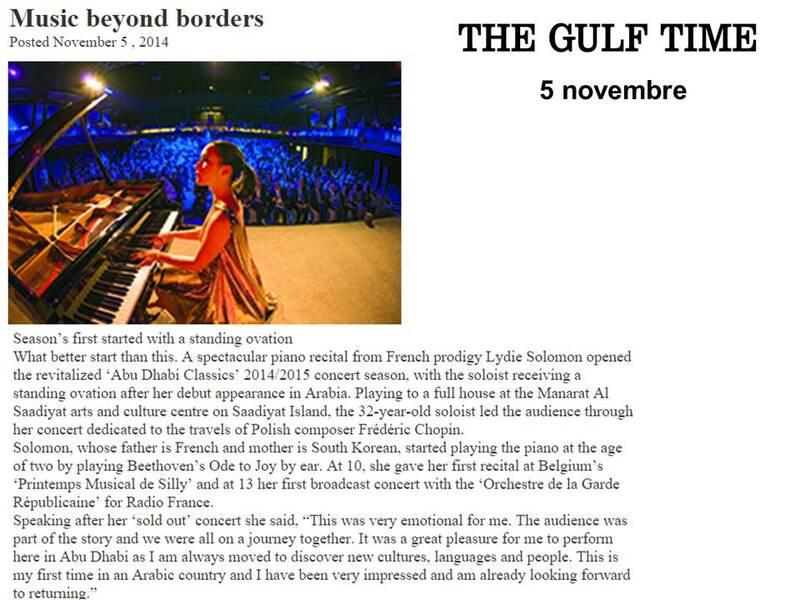 A spectacular piano recital from French prodigy Lydie Solomon opened the revitalized ‘Abu Dhabi Classics' 2014/2015 concert season, with the soloist receiving a standing ovation after her debut appearance in Arabia. Playing to a full house at the Manarat Al Saadiyat arts and culture centre on Saadiyat Island, the 32-year-old soloist led the audience through her concert dedicated to the travels of Polish composer Frédéric Chopin. Solomon, whose father is French and mother is South Korean, started playing the piano at the age of two by playing Beethoven's Ode to Joy by ear. At 10, she gave her first recital at Belgium's ‘Printemps Musical de Silly' and at 13 her first broadcast concert with the ‘Orchestre de la Garde Républicaine' for Radio France.